1. Second Kalachuri dynasty was a Yadav Haihayas dynasty, which fought with Mohammad Gouri. 2. 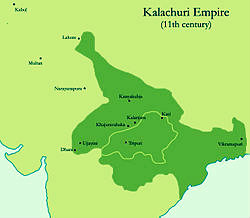 The First Kalachuri Dynasty (550–620 A.D) ruled over northern Maharashtra, Malwa and western Deccan. Their capital was Mahismati situated in the Narmada river valley. Krishnaraja, Shankaragana and Buddharaja were three prominent members of this family. They had to fight with the two powerful neighbours; the Maitrakas of Valabhi and the Chalukyas of Badami. 3. The Second Kalachuri Dynasty ruled parts of the Deccan extending over regions of present day North Karnataka and parts of Maharashtra. This dynasty rose to power in the Deccan between 1041 and 1181 A.D.
4. After the decline of the Gurjara-Pratiharas, Laksm Karna (1041–1072) of Kalachuri dynasty of Tripuri, who came to power, brought under his control almost the entire region covered by the present district of Gorakhpur. 5. But his son and successor Yash Karna (1073–1120), was unable to check the process of disintegration. 6. The Kahla inscription indicates that Sodha Deva, a feudatory of another branch of Kalachuri dynasty, had proclaimed his independence in a portion of Gorakhpur district. 7. During the same period the Kalachuri rule was supplanted by that of the Gahadvalas of Kannauj over this region. 8. 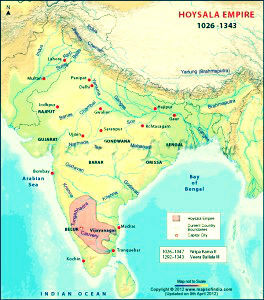 According to epigraphic evidence the kingdom of Govind Chandra (1114–1154) of the Gahadvala dynasty extended to Bihar including the area now comprising Gorakhpur. 9. Two inscriptions ascribed to Govind Chandra have also been found one each at Magdiha (Gagha) and Dhuriapar in Bansgaon Tehsil mentioning the genealogy of the Gahadvalas and the charity given by him for the prosperity of his family. 10. A number of mounds of bricks, ruins and masonry wells found at these places go to establish their antiquity. 11. The defeat of Jaya Chandra (1170–1194) grandson of Govind Chandra, at the hands of Shihab-uddin Ghuri in 1194, paralyzed the Gahadvala power and brought to an end their dominance over the district. 1. The Hoysala empire ruled most of the modern day state of Karnataka between the 10th and the 14th centuries. 3. In the 12th century, taking advantage of the internecine warfare between the then ruling Western Chalukyas and Kalachuri kingdoms, they annexed areas of present day Karnataka and the fertile areas north of the Kaveri River delta in present day Tamil Nadu. 4. By the 13th century, they governed most of present-day Karnataka, minor parts of Tamil Nadu and parts of western Andhra Pradesh in Deccan India. 5. Major political changes were taking place in the Deccan region in the early 14th century when significant areas of northern India were under Muslim rule. 6. Alla-ud-din Khilji, the Sultan of Delhi, was determined to bring isolated South India under his domain and sent his commander, Malik Kafur, on a southern expedition to plunder the Seuna capital Devagiri in 1311. 7. The Seuna empire was subjugated by 1318 and the Hoysala capital Halebidu (also called Dorasamudra or Dwarasamudra) was sacked twice, in 1311 and 1327. 8. By 1336, the Sultan had conquered the Pandyas of Madurai, the Kakatiyas of Warangal and the tiny kingdom of Kampili. 9. The Hoysalas were the only remaining Hindu empire who resisted the invading armies. 10. Veera Ballala III stationed himself at Tiruvannamalai and offered stiff resistance to invasions from the north and the Sultanate of Madurai to the south. 11. Then, after nearly three decades of resistance, Veera Ballala III was killed at the battle of Madurai in 1343, and the sovereign territories of the Hoysala empire were merged with the areas administered by Harihara I in the Tungabhadra region. 12. This new Hindu kingdom resisted the northern invasions and would later prosper and come to be known as the Vijayanagara Empire. 1. Seuna Yadavs of Devgiri helped Khilji's in defending India from Mongol Invasion. Khilji's and Yadav's had military relations, and Khilji's used Devgiri forces to defend India when the Mongols invaded. 2. After the Mongol threat was subdued, Khilji's army captured Devgiri in 1317, and that was the end of Seuna Yadavs reign. The khiljis themselves didn't last too long after that and in 1320 their rule was ended by Khusro Khan. And in 4 months time delhi was being ruled by Tughluqs. 1. Tughluq changed their Capital from Delhi to Devgiri(now Daulatabad). 2. In 1398, Turco-Mongol invader, Timur (Tamerlane) defeated four armies of the Sultanate on December 15, 1398. Sultan of Delhi Mahmud Khan and his army ran away before Tamerlane entered Delhi on December 18. The Local people Yadavs, Jats, and Mongols captured by Khiljis, tried to fight for survival of Delhi, but without an army to back and without sufficient Weapons they were no match for Tamerlane. For eight days fighting went on and Delhi was plundered, its population massacred and over 100,000 war prisoners were killed as well. 3. This was one of the greatest example of Bravery of Yadavs and Jats and Mongols, as they knew Tamerlane was coming to Delhi, and like the Sultan they could have fled too, but they chose to fight. 1. Besides chiefdoms and jagirs, the Yadavas had peethams (seats) granted to them by virtue of their religious powers. 3. When Bhagyanagar was founded by Sultan Abdulla of Qutub Shahi in AD 1560 the rights of the Yadavas were acknowledged and recognized, and the name Golkonda was substituted for Manugal. 4. According to the charter awarded by the Sultan Abdullah of Qutb Shahi dynasty in 1071 Hijri, Kondiah built the fort for the sultan by using his charisma in resolving the mystery of the site, and also discovered for him gold coins buried underground. In return, the sultan gave him the Charter conferring upon Kondiah the rights and privileges due to the head of the fourteen seats, and of twelve classes of Gollas Yadavas and two classes of shepherds (Kuruba Gollas Yadavas). 5. Kondiah, was the head of the Yadava Peethams. 1. 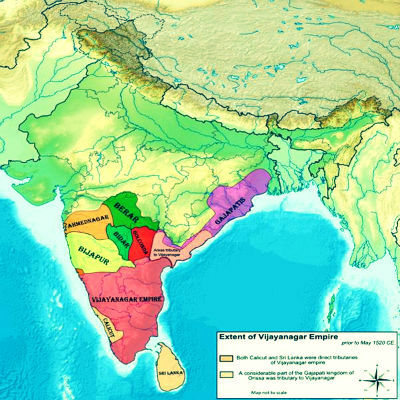 The Vijayanagara Empire referred to as the Kingdom of Bisnagar by the Portuguese, was an empire based in the Deccan Plateau region. 2. It was established in 1336 by Yadava king Harihara I and his brother Bukka Raya I. 4. The next ruler, Deva Raya I, emerged successful against the Gajapatis of Odisha and undertook important works of fortification and irrigation. 5. Deva Raya II (called Gajabetekara) succeeded to the throne in 1424 and was possibly the most capable of the Vijaynagar Empire rulers. He quelled rebelling feudal lords as well as the Zamorin of Calicut and Quilon in the south. He invaded the island of Lanka and became overlord of the kings of Burma at Pegu and Tanasserim. 6. The empire declined in the late 15th century until the serious attempts by commander Saluva Narasimha Deva Raya in 1485 and by general Tuluva Narasa Nayaka in 1491 to reconsolidate the empire. 7. After nearly two decades of conflict with rebellious chieftains, the empire eventually came under the rule of Krishna Deva Raya, the son of Tuluva Narasa Nayaka. In the following decades the Vijayanagara empire dominated all of Southern India and fought off invasions from the five established Deccan Sultanates. 8. The empire reached its peak during the rule of Krishna Deva Raya when Vijayanagara armies were consistently victorious. The empire annexed areas formerly under the Sultanates in the northern Deccan and the territories in the eastern Deccan, including Kalinga, while simultaneously maintaining control over all its subordinates in the south. 9. Krishna Deva Raya was followed by his younger half-brother Achyuta Deva Raya in 1529. 10. When Achyuta Deva Raya died in 1542, Sadashiva Raya, the teenage nephew of Achyuta Raya was appointed king though real power was wielded by Rama Raya, Krishna Deva Raya's son-in-law. 11. When Sadashiva was old enough to claim absolute power, Aliya Rama Raya had him imprisoned and became the de-facto ruler. Eager to take advantage of the disunity among the Sultanates of Bijapur, Ahamednagar, Berar, Golkonda, and Bidar , Rama Raya involved himself in the political affairs of the powers across the Krishna river to the north. 12. His ploy of supporting militarily one Sultanate against another, often changing alliances, brought rich rewards for a while. However, by 1563, exhausted with his intrigues, the bitter rivals from the north formed an alliance. They marched against Rama Raya and clashed with the Vijayanagara's forces in January 1565. 13. The capture and killing of Aliya Rama Raya in the famous Battle of Talikota, after a seemingly easy victory for the Vijayanagara armies, created havoc and confusion in the Vijayanagara ranks, which were then completely routed. 14. The Sultanates' army later plundered Hampi and reduced it to the ruinous state in which it remains; it was never re-occupied. 15. Tirumala Deva Raya, Rama Raya's younger brother who was the sole surviving commander, left Vijayanagara for Penukonda with vast amounts of treasure on the back of 1500 elephants. 16. The empire went into a slow decline regionally, although trade with the Portuguese continued, and the British were given a land grant for the establishment of Madras. 17. Tirumala Deva Raya was succeeded by his son Sriranga I later followed by Venkata II who was the last king of Vijayanagara empire, made his capital Chandragiri and Vellore, repulsed the invasion of the Deccan Sultanates and saved Penukonda from being captured. 18. His successor Rama Deva Raya took power and ruled until 1632, after whose death Venkata III became king and ruled for about ten years. 19. The empire was finally conquered by the Sultanates of Bijapur and Golkonda. 2. Ra Mandalika also fought with Mahmud Ghaznavi. Somnath temple was attacked by Muslim General Alaf Khan and was fought by Mandalika. 3. Ra Melaka (1400-1415 A.D) succeeded him who drove the Muslims garrison out but afterwords he himself was driven out. 4. Ra Mandalika III was the Ahir ruler of Junagarh (1432–1470) and was the son of Khangara III. 5. Later on Sultan Mahmud Begada forced Ra Mandalika III embrace Islam or face death, and thus ended the relative independence of Saurastra. Ra Mandalika III accepted Islam and received the title of Khan Jahan and his descendants long occupied the respectable posts at the Gujarat Court. 1. Mughals began their rule with Babur in 1526. Humayun was defeated by Sher Shah Suri in 1540, but later Sher Shah Suri died in 1945, and Humayun came back to power. 2. When Shershah Suri fought against the Mughal chief Humayun, the Ahir ‘Khap’ helped Humayun under the leadership of Rao Rura Singh. 3. When Humayun occupied the throne of Delhi again, he made Rao Rura Singh the Chief of a Pargana. The Head Quarters of the Pargana was named Rewari. 4. During the reign of Mughals, until the time of Aurangzeb(also for a short duration after second battle of Panipat), the Ahir State continued as an ally, and Rao Tej Singh made a name with them. 1. Ahirs of the region had an alliance with Humayun. 2. But when Hindu king Hem Chandra Vikramaditya declared mutiny against Delhi Rulers in 1556, because the battle was happening near the Ahirwal region, Ahir Pargana of Rewari declared their support for Hemu, and a sizable number of Yadav warriors fought in his army to remove the musilm rule from the region. 3. 1000s of Yaduvanshi Ahirs from Ahirwal region came together to fight against Akbar in Second Battle of Panipat. 4. In the battle, Hemu's army was fighting well and were comfortably outnumbering Akbars army, suddenly Hemu was hit by an arrow in his eye, and a panic ensued after that. The battle was lost. 5. Akbar ordered killing of every single hindu captured, and minarets of their heads were made and these minarets were on display for many years to come. 6. Akbar later again made an alliance with Ahirwal Pargana, and Rewari Pargana was re-instated later to make peace in the region. 1. Nawab of Narnaul, Taherbeg, kidnapped a Hindu girl. 2. Yaduvanshi Ahirs who were the local residents of Narnaul, took this event as a disrespect to Hindus. 3. 100s of Yaduvanshis got together and revolted against the Nawab of Narnaul. They were well supported by the Sikhs in that area. 4. Yadavs fought and captured Taherbeg and then killed him. Narnaul ke gorve, mara diya Taherbeg." 1. The Mughal dynasty ruled most of the Indian subcontinent by 1600; it went into a slow decline after 1707. 2. Senua Yadav Princess Jijabai was a lady of great repute, she had the Royal Yadav Blood in her. 3. She always wanted that the glorious days of Rule of her ancestors i.e. Seuna Yadavs of Devgiri, should come back, and Yadavas should again rule the region. 4. She raised her son Chatrapati Shivaji to become a warrior. 5. Shivaji later defeated Shaista Khan, Kartalab Khan, etc. and many more Mughal Warriors, and declared war against Mughals, defeating them at many places. 3. After the death of Shivaji in 1680, his son Rajaram came to the throne. 4. Dhanaji Yadav replaced Santaji Ghorpade to became the chief of the Maratha army in 1696 and remained on the post until his death in 1708. 5. Dhanaji was a great military commander, he captured Ismail khan Makha, looted surat, defeated mughal army under Nazar Ali, and Killed Kasim Khan during his military career. 6. After death of Dhanaji Jadhav, his son Chandrasen Jadhav replaced him at the post. 7. Shivaji's other son Sambhaji was later captured and killed by Mughals forces. 8. Maratha forces later defeated mughals in Malwa. 9. In 1758 Marathas captured Peshawar. In 1761 Maratha's lost to Ahmed Shah Abdali in Third Battle of Panipat. 1000's of Yadavs in Maratha army were killed. 10. Ancestors of Rao Tularam fought in the Anglo Maratha war later, and as a result of which they got the ismetdari of multiple villages of Ahirwal. Rao Tularam later became an important figure in the 1857 Indian revolt against British. 1. As the Sikh empire was gaining prominence in the region, Yadavas of Ahirwal region joined the Sikh army in a large number. The Ahirwal region at the time of Sikh rule had some Muslim Nawabs. 2. One of the prominent Yadav Member of the Sikh Army was Pran Sukh Yadav. 3. Pran Sukh was very close to the Chief of Sikh Army i.e. Hari Singh Nalwa. Pran Sukh fought under the command of Hari Singh Nalwa in multiple battles. 4. Pran Sukh fought in the battle of Kashmir, when Muslim rule of 500 years was ended. He showed great bravery in that battle at the age of 17 years, and hence as a reward was taken in direct command by Hari Singh Nalwa for future battles. 5. One important battle where Pran Sukh proved his mettle was the battle of Mangal, where he singlehandedly killed 100s of enemy force. The battle's victory was huge because the Sikh had an army of 7000 men compared to 25000 strong enemy army. Sikh army lost 2000 men in that battle. 6. Later on Pran Sukh Yadav become a leader of some Sikh army units. He was instrumental in many battles. He also fought for the Sikh army in both the Anglo Sikh wars. 7. Many Yadavs took part in the army of Sikhs, and laid their lives to bolster the Punjab pride. Some of these Yadav warriors later fought in the Nasibpur battle. 1. Ahirs ruled the whole of Haryana under the Mughal rule and later were declared as independent kings. 2. Rao Tularam the King of Rewari, was declared as the leader of revolt against Britishers by Mughal King Bahadur Shah Zafar, and Nawabs of Bawal, Mewat, and Jhajjar fought under him in the famous battle of Nasibpur. 3. A majority of Ahirs occupy the Rewari Thesil of Gurgaon district. 4. When Shershah Suri fought against the Mughal chief Humayun, the Ahir ‘Khap’ helped Humayun under the leadership of Rao Rura Singh. When Humayun occupied the throne of Delhi again, he made Rao Rura Singh the Chief of a Pargana. The Head Quarters of the Pargana was named Rewari. 5. During the reign of Mughals, the Ahir State continued as an ally, and Rao Tej Singh made a name with them. 6. But after the movement of Aurangzeb of Islamization of the country, Ahirs broke their alliance with the Mughals. And afterwards Ahirs fought against the Mughals in the army of Marathas and Sikhs. 7. In 1803 Lord Lake reduced the power and position of the Mughals and captured the Ahir State, then ruled by Puran Singh. 9. Rao Raja Tula Ram was mainly active in the areas of Rewari and Narnaul, where he fought and captured all the areas under the British rule. He led the famous Nasibpur battle against the british army in 1857 revolt. 10. The Current Ahirwal region of Haryana has area near Behror in Rajasthan, Narnaul, Rewari, Mahendragarh, Gurgaon in Haryana.